Probably best known for his chilling role as desperate chemistry teacher turned meth kingpin Walter White on the groundbreaking series “Breaking Bad,” Bryan Cranston is a journeyman actor who has relished the challenge of difficult roles like White or President Lyndon B. Johnson, and also avows the benefits of hard work and necessity of failure. His parents met in an acting class in Hollywood, so he almost seemed set up for a life before the cameras from the get-go. A starring role as Professor Flipnoodle in a school play wasn't enough to convince him that acting could be a viable path. Cranston had his sights set on becoming a police officer. But he needed some elective courses to balance his criminal justice studies in college, so he signed up for Intro to Acting and Stagecraft. His love affair with acting had begun. However, the course of true love never runs smoothly, and neither did Cranston's journey to the stage. A two-year odyssey riding motorcycles cross-country with his older brother enabled him to see that he was meant to pursue acting and not the life of a cop. But he was wary, seeing what pursuing acting did to his father, who left the family when he was young and wouldn't return for over a decade: "My dad wanted to be a star. No doubt. No compromise… The man did not lack for ideas. He approached each venture with vigor, but seldom found success. His failures mounted and at him." Did he want that life for himself? Periods of unemployment? Never knowing when you're going to work again? Could he handle the transitory nature of the business? During his travels with his brother, they took jobs at the Daytona Playhouse and threw themselves into all aspects of play production. When Cranston got a taste of being in front of an audience and really doing the work to get there, he knew there could be no other path to travel. "...a wonderful, unexpected, introspective, meandering and incredibly honest journey that highlights a satisfying career, but more is actually gleaned from the life lessons learned along the way." Upon his return to Southern California (with a young wife in tow), Cranston threw himself into his new profession, taking classes, and doing whatever menial labor job paid the best in order to pay the bills. He started enjoying some modest success, getting commercials here and there. But there was still something nagging at him. He didn't want to be married anymore and knew his wife wanted a home with children. Finally coming clean with his feelings, Cranston and his wife split amicably and she remarried within six months. Now he had the time to focus solely on his burgeoning career. He landed a job on a new soap opera called “Loving,” which filmed in New York, and jumped at the chance to change up his environment. This was just the beginning. Throwing himself into the role of young Doug Donovan, Cranston spent the next two years absorbing all he could, from the intense work schedule to the insane amount of memorization a soap actor has to do in a week. Two key events during his time in New York made him solidify his plan to keep acting. Perhaps the most frightening of these events was the ongoing stalking by an ex-girlfriend that seemed destined to end horribly. Dealing with this emotionally unstable ex surely gave him insight when it came time to play more morally corrupt characters like Walter White. From soaps, Cranston moved into guest roles on TV shows in the '80s and '90s, including “Seinfeld” and “The X-Files,” then eventually a regular role as the hapless dad, Hal, on the sitcom “Malcolm in the Middle,” where he enjoyed his first real brush with success, getting a Golden Globe and three Emmy nominations for his role. When that series ended, he was at a crossroads. In the intervening years, he met and married his wife, Robyn, and had a daughter. Since his home life had become blissfully stable, he was up for taking chances in his career. There was the script for a pilot called “Breaking Bad” that intrigued him. Created by Vince Gilligan of “The X-Files,” it told the tale of a put-upon chemistry teacher diagnosed with lung cancer who partners with a former student to manufacture meth in order to provide for his family. Not exactly your typical cheery family entertainment. But something about this part was different. Cranston knew he could play it, he had to play it. Gilligan remembered him from his appearance on “The X-Files” and thought he'd be great. They just had to convince the network. After a little cajoling, he got the part. Discussing his character with its creator, Gilligan confided that he wanted to take Walter White "from Mr. Chips to Scarface." And together, Cranston, Gilligan and co-star Aaron Paul made TV history. 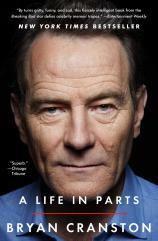 With Cranston having far from a linear career, A LIFE IN PARTS is not your typical actor's memoir. Instead it's a wonderful, unexpected, introspective, meandering and incredibly honest journey that highlights a satisfying career, but more is actually gleaned from the life lessons learned along the way. The book's epigram is "One man in his time plays many parts," a line from Shakespeare's “As You Like It,” and Bryan Cranston's life and career are the perfect example of the Bard's sentiment.